Already have BNC to banana jacks. Will this work as is with Verus Edge and Zeus by Snap-On? Adapters needed? Yes, the Pico WPS500X will work will all Snap On scopes. If you already have a banana to BNC adapter, you will not need any other adapters. If you plan on using the WPS500X with only a Snap On scope, we can end you a lead that will connect the WPS500X directly to the Snap On. In the "Shipping Instructions", tell us which scope you are using and we will remove the standard BNC lead and replace it with a Banana lead that eliminates the need for the adapter. The Snap-on scopes presets do not convert the measurements (V to PSI) for aftermarket transducers such as the Pico WPS500x. The preset menus in the Snap-on MODIS are designed only for Snap-On transducers. 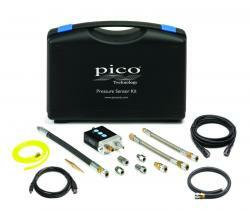 When using the Pico WPS with the Snap-on scopes you have to calculate the conversion of the Voltage to PSI. #1 1V/100psi Use for cranking and running cylinder compression or fuel pressure testing #2 1V/10psi Use vacuum tests and fuel system tests. #3 1V/1psi Use with the exhaust adapter to measure small pressure changes. For example, if you are using Output Range #1 and your waveform peaks at 5v what is your PSI? 5v * 1v * 100psi = 500psi. For example, if you are using Output Range #2 and your waveform peaks at 300mV what is your PSI? .3v * 1v * 10psi = 3psi. For example, if you are using Output Range #3 and your waveform peaks at 500mV what is your PSI? .5v * 1v * 1psi = 1/2psi. When you buy it, tell us... "Please ship lead for Snap-on scope." We will replace the factory lead and replace it with one that will eliminate the need for an adapter.